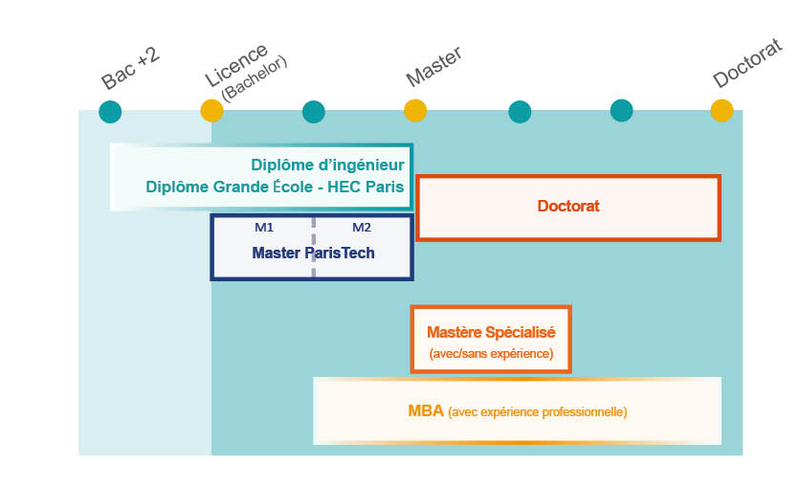 These Grandes Écoles offer courses leading to the diplôme Grande École d’ingénieurs (MSc in engineering) and the diplôme Grande École de Management (MSc in Management). ParisTech brings together 12 of these engineering and management Grandes Écoles in the Ile-de-France region, which are acknowledged as the best in their fields, and are characterised by their high standard of education and the excellence of their teaching staff and laboratories. Beyond the individual actions carried out by its member Grandes Écoles, ParisTech's international commitment is shown through bilateral partnership agreements with prestigious foreign institutions and its incorporation in the co-operation networks dedicated to teaching and research. The institute is a preferred French partner for major foreign universities in the scientific, technical, and managerial fields. International partnerships are a key area for ParisTech and the success of the co-operation programmes initiated confirms this international mission. ParisTech co-ordinates recruitment of the best international students in some countries for all of its Grandes Écoles. Due to this operation, more than a hundred students come to study in the member Grandes Écoles each year. Mobility allows you to develop open-mindedness to an international environment and to be trained in a multicultural context. France offers the combination of high technology, innovation and tradition, but also history, tourism, quality of life and excellence in higher education. ParisTech students are very active, and the Grandes Écoles are bustling with associations and networks to get in touch with each other. They are also involved in countless social and cultural projects and initiatives. And the choice of cultural attractions in and around Paris that you can enjoy while studying at ParisTech is virtually endless. ParisTech Sud in Saclay, ParisTech Est in Marne-la-Vallée and ParisTech Centre in the heat and heart of the Latin Quarter are all great places where you can enjoy campus life as much as city life. Most Grandes Écoles have world-class accommodation, restaurants and other facilities, and help new students with their administrative formalities. They also organise language courses for students who come here without the required proficiency in French.